Each fall, my grandmother and I would go to the near by orchards and pick apples. Since most of our neighbors had an apple orchard, there was always plenty of apple picking to be done. I enjoyed these special outings with her, and cherish them today. These bushels of apples that we were picking were going to be used for several apple recipes. Apple pie, apple jelly, apple sauce, baked apples, apple cobbler, apple cider, apple crisp, apple juice, and apple cider vinegar. Some apples were put in the root cellar for winter eating. Whew. No wonder why I was always tired after helping Grandma. No apple, peel or core ever went to waste. The apples were used to make the fine desserts, juice and cobblers. The peels and core were used to make fresh natural pectin. One year, we had some left over apple sauce. It wasn’t enough to can, and it was more than we wanted to eat. Grandma, in her “can’t let that go to waste” attitude (could that be an inherited trait), decided to go about making a pudding that we could have for dessert after supper. We all loved the pudding, and it’s now been passed down to my children. I look forward to each fall, when my granddaughter and I go pick apples. Together, we peel, cut and core apples for applesauce, apple pie, and other apple desserts. We do the same thing my grandmother and I did, and of course, we make this apple pudding too. It’s lovely knowing that this recipe will be passed down to yet another generation. 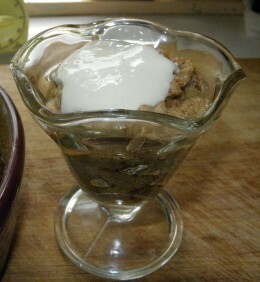 Apple Pie in a Dessert Cup! Puree the apple in a blender or food processor until smooth and creamy. Add the sugar and the spices to the blender. Blend on low until mixed. Add the evaporated milk and regular milk. Blend on low until mixed. Add the three eggs, and blend on low until very well blended and mixed together. Pour into a 2 quart casserole or oven proof glass bowl. Place dish onto cookie sheet. This helps keep the over clean if any spills. Place cookie sheet in the middle of the oven.Bake at 350 degrees F for 50 to 60 minutes. Time will vary on your oven and oven temperatures. Cool, and garish with cool whip, vanilla ice cream, or vanilla yogurt. You can also add sliced apples as a garnish. Serve in dessert glasses or your favorite dessert cups. 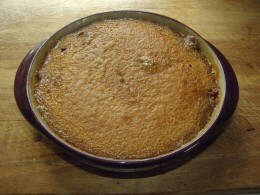 The pudding tastes best when eaten while it is still warm from the oven.